This piece is definitely on the more experimental side for me. The story has changed a little from its initial conception, so the synopsis on the website is outdated. AN INTER-DIMENSIONAL LOVE STORY tells the story of a2, who is a square from Flatland, a 2D universe loosely based on the book ‘Flatland’ by Edwin A. Abbott. A2 follows a monotonous, prescribed routine each day, but his life is turned upside down when he falls in love with a three-dimensional being, Charlotte. In order to reach her, he travels between the 2nd and 3rd dimension, wherein each dimension is represented by a different style of puppetry. Now that’s a long distance relationship. After the fall of Imperial Russia, the Romanovs have become the stuff of legend. They are painted as monsters – or saints – or children’s cartoons. Using original source material, this documentary play tells the real story of the people at the center of a revolution. What happens when one family can change the fate of the whole world? 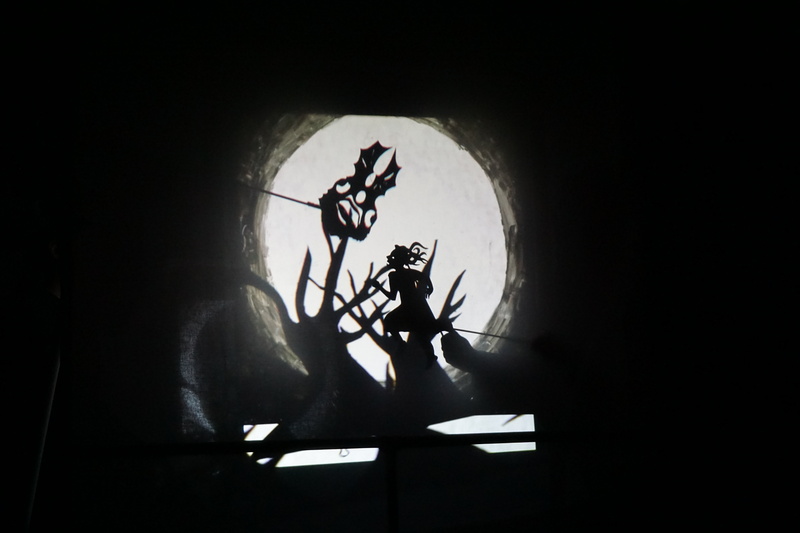 The play is inter-cut with shadow puppet vignettes that are housed inside a pop-up book. There are also mobile shadow puppet silhouettes on dowels. 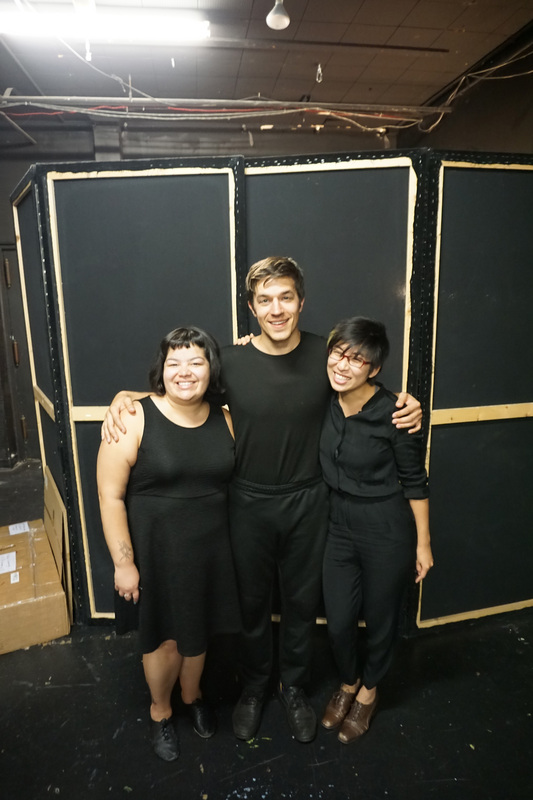 SPOT OF BOTHER opens tonight as part of the A-Squared Asian American Performing Arts Festival! We will be performing alongside an eclectic selection of performers, ranging from musicians, comedians, dancers, and installation artists. We will be performing SPOT OF BOTHER at this late-night shadow puppet cabaret. I will be a panelist on this shadow puppeteer panel. 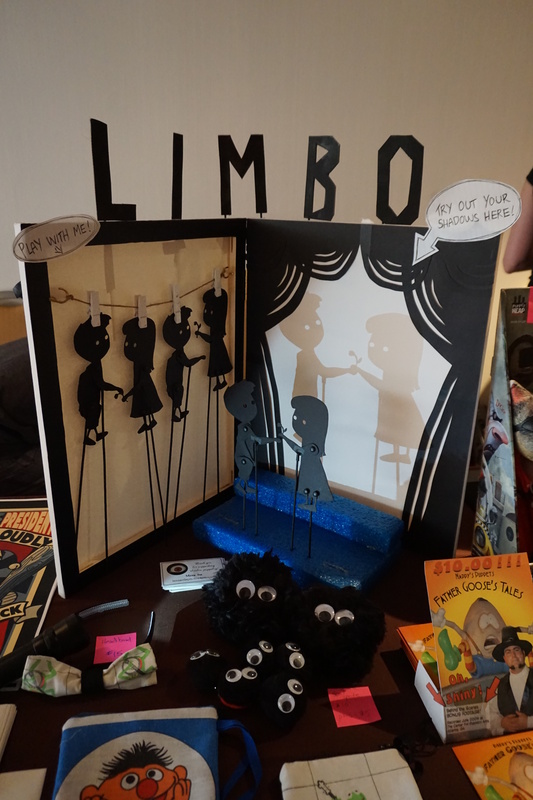 THROUGH THE LOOKINGGLASS was selected to participate at this year’s National Puppet Slam in Atlanta, GA! 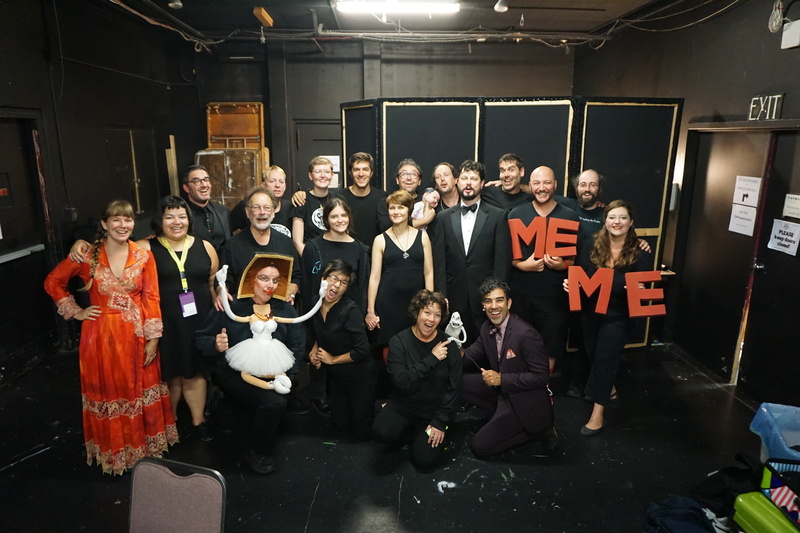 We are extremely honored to be invited to perform at the Center for Puppetry Arts, the largest organization in the United States devoted to puppetry. A big shout-out to Mike Oleon who nominated our piece. Thank you so much, Mike! 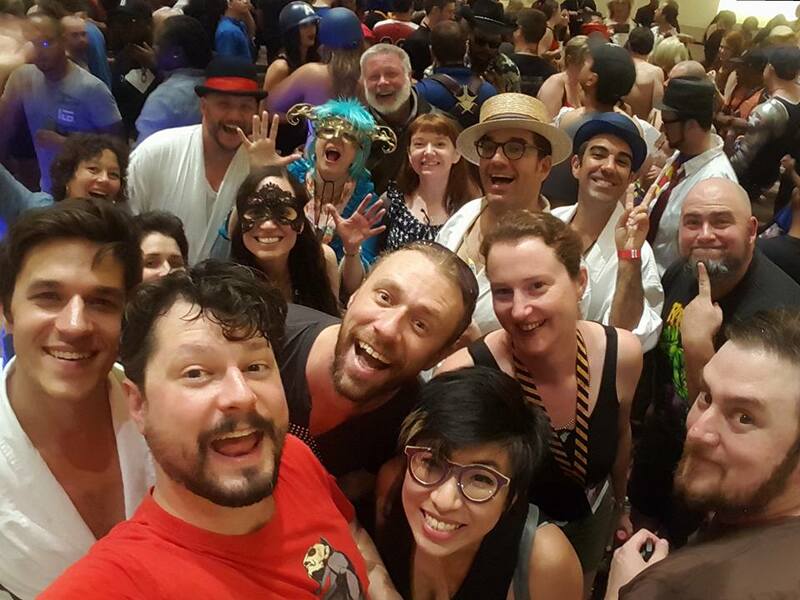 All the performers for the 2016 National Puppet Slam! My short film version of SPOT OF BOTHER was selected for Illinifest 2016, a film festival at the University of Illinois! The festival will take place on April 24 at the Urbana-Champaign campus. Apparently there were 120+ submissions this year, so I was pleasantly surprised that SPOT OF BOTHER got chosen, especially since it is basically my first film. Hopefully it fares well in the competition! Update (4/19/16): The nomination list just came in…SPOT OF BOTHER is in the running for the Grand Jury Award and for Best Editing! It is the only animated film nominated in these categories. I performed my first non-shadow puppetry piece at Nasty, Brutish & Short! This was a solo show called TOLERANCE 101, featuring Sir Arthur Harringford, a rat that I taxidermied into a puppet with movable limbs and jaw. Prof. Harringford gives a seminar on tolerance at a cardboard lectern, that is projected onto a large screen via live camera feed. This piece was extremely nerve-wracking, being my first piece that so heavily relies on speech. Not to mention, literally using a dead animal as a puppet can easily dip into bad taste. 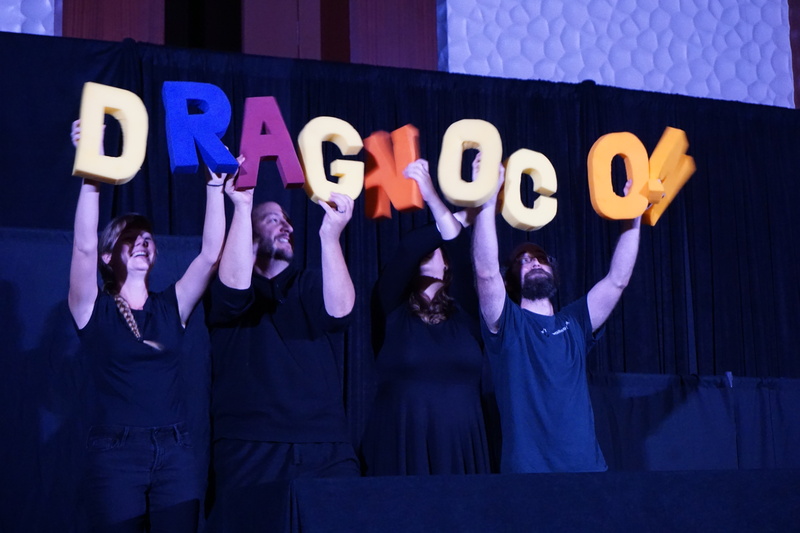 With my shadow puppet pieces, I’m so used to having my back towards the audience, so this kind of performance forced me to exercise a very different set of puppeteering skills. I’m so grateful for the audience’s positive response and I took away a lot from the experience. 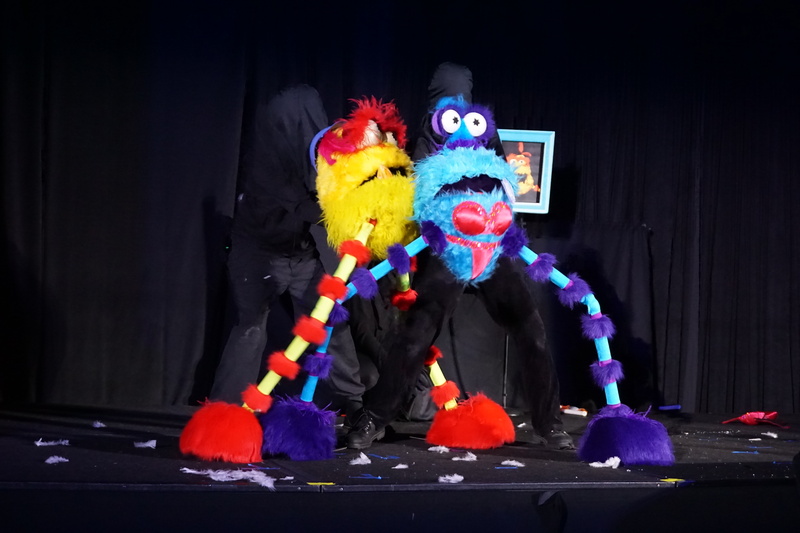 Even though the speech was entirely scripted and rehearsed, performing in front of a live audience made me realize just how difficult it is to negotiate between being a “performer” and a “tool” for the puppet. It was like rubbing my stomach and patting my head at the same time. Major kudos to puppeteers out there who can do stuff like this! Sir Arthur Harringford, a taxidermied rat gives a seminar on TOLERANCE 101. To accommodate his small stature, his lecture will be projected via live camera feed. As mankind’s most reviled creature, Sir Harringford feels he has much to share on the topic of tolerance. This past November, I visited the Kansai region in Japan for the first time! After discovering that the National Bunraku Theater is located in the heart of Osaka, of course we HAD to go see a show there. The theater is right near the Nipponbashi stop on the Sennichimae train line (pink). When looking for ticket information, we found that a Bunraku play doesn’t follow the typical 1hr30min standard length. The theater had two shows scheduled: The Vendetta by Two Sisters and The Nine-Tailed Fox, but they were advertised as Part 1 and Part 2 respectively. Part 1 is a matinee, and Part 2 starts later in the afternoon. Both shows are a whopping 4hrs30mins long! Meaning, that if you wanted to see the entire performance, you would be in the theater for 9 hours! Tickets are thereby sold by “section.” Each Part is divided up into 2-3 sections that have intermissions in between and tickets are priced according to the length of the section. A long 2hr section costs something like ¥2,400 (~20USD) and a short 25min section costs ¥500 (~5USD). Basically, Tamamo no Mae kills the emperor’s daughter and assumes her identity. She conspires with the emperor’s brother to overthrow the country. However, under the suspicions of the royal adviser, she is tricked into participating in a ceremony that reveals her identity as a kitsune. The theater was quite large and had traditional lanterns strung along the mezzanine. Concealing the stage was the iconic black, orange and green curtain, which I previously thought was only used in kabuki. Off to the side of the main stage is a small revolving stage, where each narrator and shamisen player duo perform. There were probably 6 different pairs that performed in the section I saw, each with their own introduction ceremony. A pair bows after their piece, and while they are hunched over, the stage rotates, revealing a new duo from the other side of the wall! I wasn’t expecting this at all, and had to stifle a laugh the first time it happened. Why are swiveling doors so funny?? The main stage is comprised lowered tracks so that you can only see the upper torso of the puppeteer. This allows the whole body of the puppet to be manipulated by the puppeteers at a full standing position. There was a clear hierarchy among the puppeteers – who are all men by the way – with the older, more senior puppeteer controlling the head and right arm, and his masked apprentices manipulating the left arm and feet. Not only is the head puppeteer unmasked, but instead of a stark black kimono, he also wears a more elaborate kimono. Junior puppeteers only take the lead when performing minor characters. The main attraction, the fox puppet, is single-handedly manned by perhaps the most experienced member in the troupe. Usually only very minor characters are operated by less than 3 puppeteers, so it was interesting to see such a central character assigned to just one guy. To keep a sense of continuity, the same guy was also the head puppeteer for the fox in disguise as the princess. Amazingly, the two transitions in the play, from fox to human then human back to fox, were both pretty much done onstage. The first transformation was done by having the fox attack the original princess behind a screen door, the lights flash, and the fox reappears as a fox-human. The final transformation back to the fox however, was done even more swiftly. 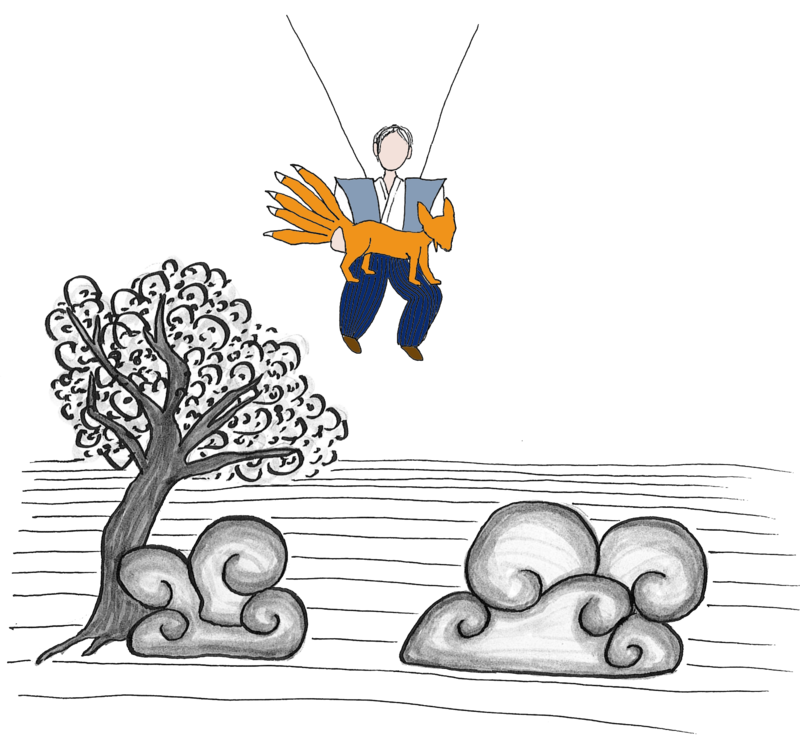 Once the fox’s guise is forcibly revealed in the prayer scene, the fox-human reels forward and is quickly swiped away as the head puppeteer pulls out the fox from the same spot. The highlight of the show was definitely towards the end when the princess is forcibly reverted back to her original fox form. 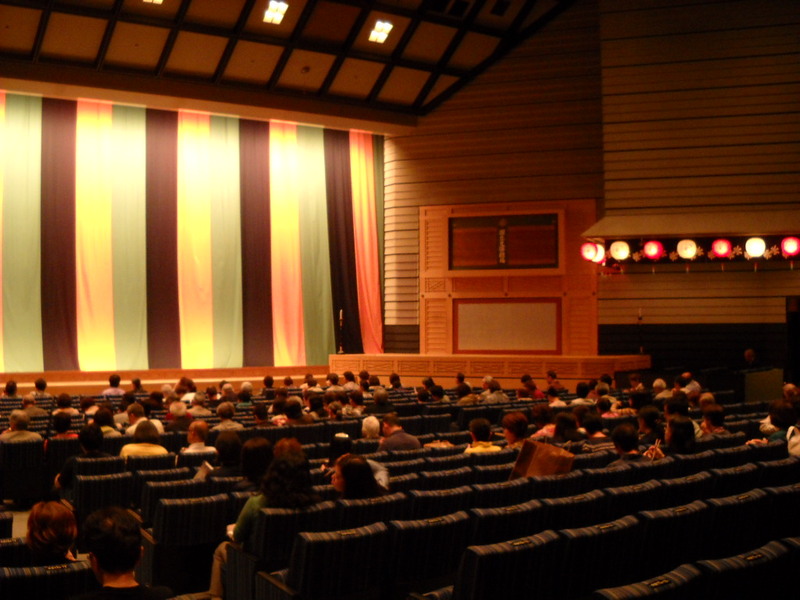 Being at the “National Bunraku Theater,” I thought that the performance would be done as traditionally as possible. So to my surprise, the fox puppeteer was hoisted up into the air from a wire harness for the kitsune’s escape! It fit the mythical dimension of the narrative very well so I’m glad they took advantage of modern theater facilities. 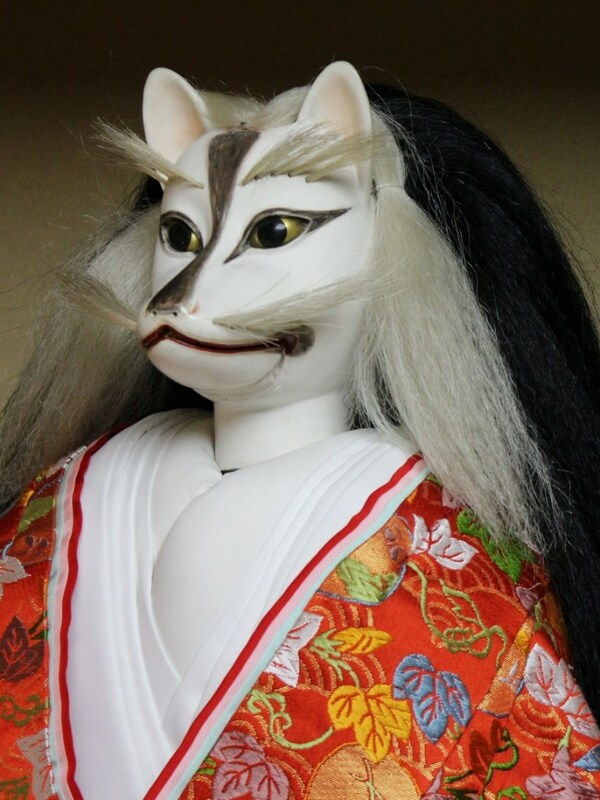 I have no idea how it was constructed, but the fox in human form had a special flippable head mechanism (called menketsu) that could switch back and forth between a fox and human face. Even the hair changes between white in her half-yokai form and black in her human form. I’ve never seen a puppet head switch like this so fast and smooth. It reminded me of bian lian performers who can almost instantaneously change their masks with a quick swipe of a fan or head turn. Male and female puppets also have different mechanical designs. Female puppets are literally designed without legs (and even arms), which is perhaps eerily reflective of the constrained life of female royalty at the time. 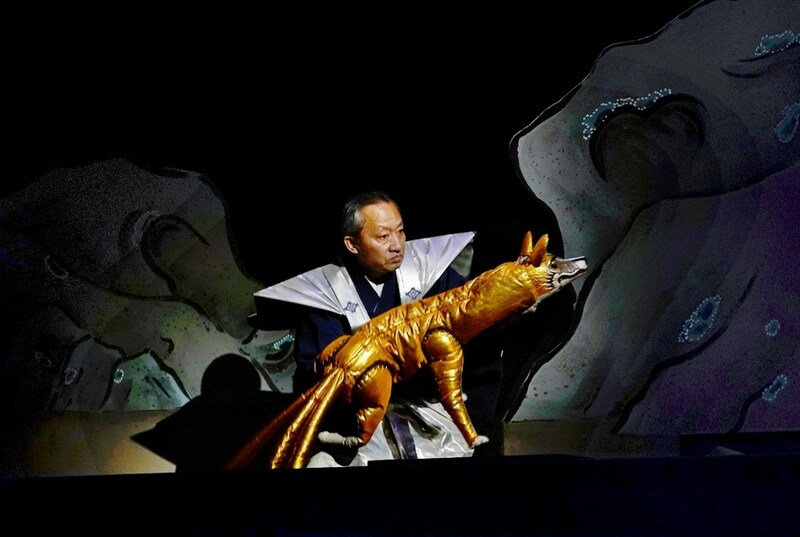 To create the illusion of limbs, the puppeteers would masterfully gesture with the puppet’s kimono by clenching the sleeve in a certain way, etc. When walking, female puppets are able to naturally glide across the stage by the movement of her hem. 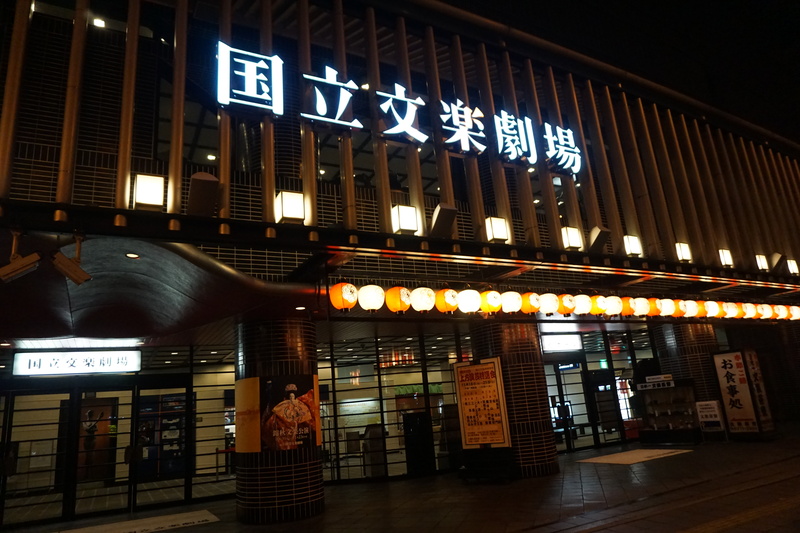 This is all to say that should you ever find yourself in Osaka, you must check out the National Bunraku Theater. The tickets are affordable and you can even see a short segment for just ¥500 if you’re on a super tight budget. The narration is accompanied by Japanese surtitles, but you can ask for a program in English/Chinese/Korean. You won’t get a line-by-line translation, but you’ll be able to get a rough idea of the story.